Avomeen expands its ability to create custom formulations based off of the innovative ideas of its clients. We have re-engineered or reformulated numerous products for clients adding additional performance properties, lowering production costs, and solving a variety of other concerns that manufactures had with their products. Expanding upon its research and development capabilities Avomeen is now offering custom product formulation services. Hiring a custom testing and analysis laboratory such as Avomeen allows clients to both enhance existing products and expand their product lines. Avomeen specializes in the development of polymers, coatings, cleaners, cosmetics, pharmaceutical and adhesive products. 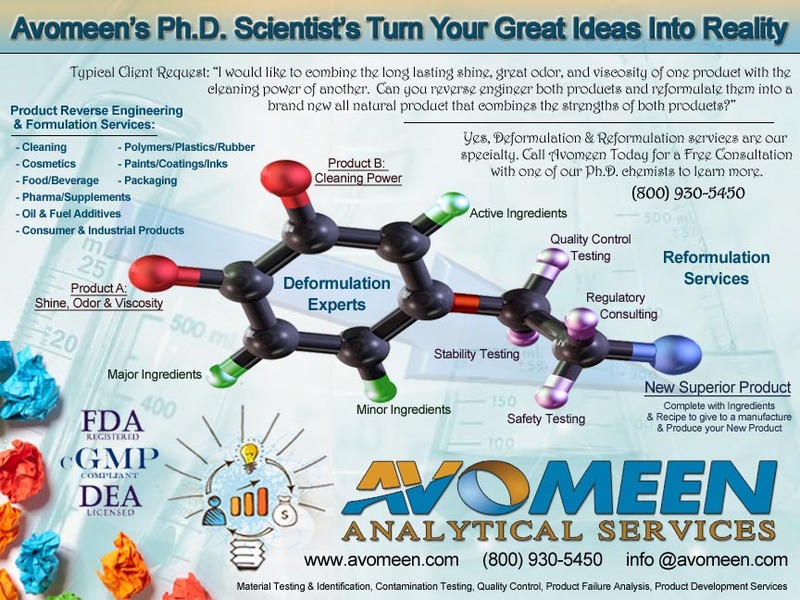 Avomeen has recently expanded its wide range of instrumentation with additional new advanced analytical instruments and has also hired several new formulation chemists allowing the custom testing and analysis laboratory to develop custom product synthesis in a range of industries. From specialty chemicals to pharmaceuticals Avomeen’s laboratory can create a variety of commercial and industrial products. Avomeen is a non-routine product development and investigative laboratory that specializes in product deformulation, reformulation and formulation services. This coupled with their ability to solve tough product failure problems and skill at material and contamination identification has allowed Avomeen to experience tremendous growth. Specializing in paints & coatings, cleaning products, cosmetics, food & beverages, adhesives & sealants, pharmaceuticals & supplements, rubbers, polymers & plastics, and medical device packaging the advanced testing laboratory has expertise in a range of commercial and industrial industries. 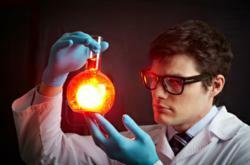 Realizing that not all of their clients have an in-depth experience with chemical analysis services they provide free consultations with their Ph.D. chemists and produce their detailed reports to contain summaries, charts, and detailed data which helps to simplify the complex processes utilized by the chemical analytical laboratory.